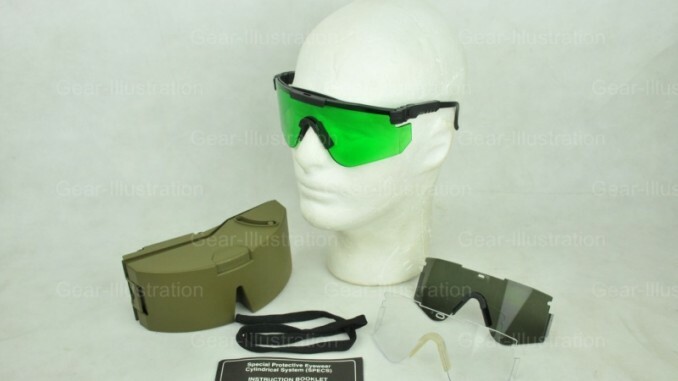 The Special Protective Eyewear, Cylindrical System (SPECS) program was initiated in 1991, and is based on a requirement, approved in 1984, for ballistic and laser eye protection. SPECS successfully completed evaluation and was Type Classified Standard in May 1995. The first contract for production of SPECS was awarded for 1Q-FY97, and First Unit Equipped was scheduled for 4Q-FY98. Special Protective Eyewear, Cylindrical System. SPECS is designed to provide ballistic, solar, and laser protection for soldiers with normal vision. That is, for soldiers who do not require prescription lenses. The SPECS system consists of a lens carrying brow-bar, interchangeable spatula and cable temples, a nosepiece, and four interchangeable lenses. The temples are capable of panoscopic angle adjustment for maximum fit, comfort, and acceptance. However, peripheral vision is limited when wearing SPECS. Lenses provide 2- and 3-wavelength laser protection. All lenses are ballistic protective capable of defeating a 5.8 grain, T-37 shaped fragment simulating projectile at 650 feet per second. The SPECS are designed to accommodate the 5th percentile female to the 95th percentile male in two sizes, regular and large. A hard carrying case is available that can accommodate a complete spectacle assembly consisting of a frame and two lenses. The carrying case has ALICE clips for attachment to an equipment belt, suspenders or pack. Clear. This lens transmits approximately 95 percent of light and has no effect on the color of objects. Green. This filter is designed to protect users from specific wavelengths. This filter markedly attenuates red and mildly attenuates yellow, blue, and brown. Green is enhanced. Brown (dark orange). This filter is designed to protect users from specific wavelengths. This filter markedly attenuates all colors, especially blue.